For those of you that are not familiar with Ginseng, it has various documented medical benefits. Ginseng and coffee drink is very tasty and has a pleasant aroma, offering you the natural properties of Ginseng & Coffee while providing you with that energy required for the day ahead. Ginseng needs no introduction because it is probably the best known and most extensively used energizing substance to be found in nature; however we will provide the reader with some important information for the purpose of getting better acquainted with it. Ginseng (Panax ginseng) is a perennial plant belonging to the Arialiacease family. The Panax Ginseng has been known for thousands of years as a universal cure. The terms Panax, from the Greek – Pan (everything) – Akeia (Cure) are the origin of the word panacea, a remedy for illness. The name ginseng derives from the Chinese word “rensheng” which means ‘man’ and was most probably chosen to describe the peculiar shape of the root which in fact is known as “the root in the shape of a man”. Ginseng is completely free of toxic substances. It grows in various areas of Asia and America where the climate is rather cold. The Asian species is the most used, it produces small red berries and grows in shaded areas in the forests of Manchuria and Korea. Used in Chinese tradition for a long time for its pharmaceutical properties, the Ginseng root has beneficial effects, which explains why the plant is so sought after. For the greater part of its history ginseng has been obtained in its natural environment but its continual use has exhausted the naturally available supply and so the cultivation of ginseng was started. Indeed today it is very difficult to find wild ginseng and when the wild plant is found it is sold at exorbitant prices. 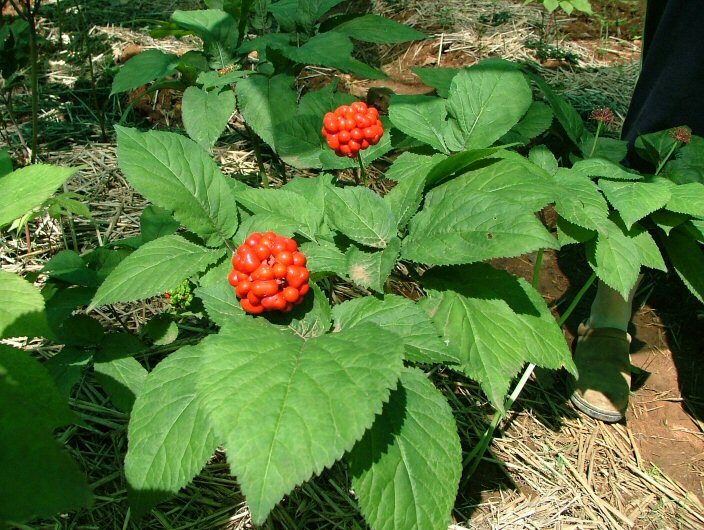 Ginseng is a short root that prefers cool temperatures, dry soil and shade. The root consists of a tuber with numerous branches and the wild species has the therapeutic properties for which it is so desired. In order to obtain the valuable properties in the domestic plant a long laborious cultivation is required. The soil must be prepared as its quality is an important factor. Then if we add the fact that once Ginseng has been grown it cannot be grown again in the same field for a period of about 15 years at least, this makes the plant even more rare. The Eleutherococcus Senticosus is known as Siberian Ginseng for its origin, Korean Ginseng seems to be the plant that has been used longest for therapeutic applications compared to the other species. The Panax Quinquefolium, and P. trifolium grow in North-America and the other species growing in Asia. Medicinal plants can provide valid support for the wellbeing of the organism. 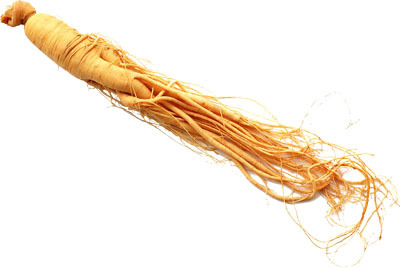 Panax Red Ginseng is the most appreciated and the plant needs to be grown 4 to 6 years before the root can be used. Based on Scientific Study, it has all of the Vitamins of the B group as well as Vitamins C, A, E and K which are used for its properties. It also has the ability to control high sugar levels in the blood and is used as a muscle integrator. To increase everyone’s awareness concerning the purchase of products, which can be beneficial to the health, a doctor should be consulted. Ginseng is one of the most famous Oriental medicinal herbs in the world. Used for more than 5,000 years in China, ginseng was introduced into Europe by Marco Polo. The use of Medicinal herbs has a very long history in the Orient: in fact the father of Chinese agriculture, Sheng Nung taught people how to grow plants, increase its harvest and by tasting the herbs, he was able to describe their properties and values. In Chinese medicine it is considered the most important herb to increase and strengthen the vital energy (QI) of the body. This energy is the source of life because it is the driving force behind movement, transformation and perception. A range of food products with many beneficial properties can be obtained using this famous root. It is impossible to have a conversation without talking about it, the friend of thousands of days, always ready to fill you with its raw energy … Ginseng Coffee. This latest discovery in “bar Trends” is in simple words a soluble beverage, which can be offered and served in a small or large cup, normally hot, but also shaken with ice perhaps decorated with whipped cream and dusted with chocolate powder or chocolate bits. 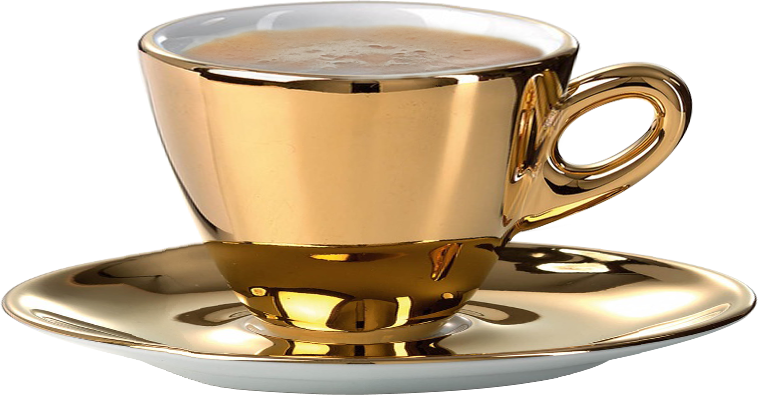 In general it is slightly more costly than a normal coffee, but it has spread rapidly in the bars of many cities. It is an explosive mixture of flavor and vitality, the superb idea of combining coffee and ginseng. The pleasant aroma together with the inviting froth make this “Coffee” a truly unique drink, the flavor is pleasant with a hint of caramel and a nut-brown colour. It is not strong and for many it represents an excellent break which gives you energy almost like the classic coffee, but with a percentage of caffeine content exceedingly low. Generally already sugared it is simple to prepare and adds pleasure to those moments for a break, restoring the spirit and giving the body the efficiency and energy to cope with the wear and tear of daily modern life. Drink Ginseng Coffee, a cupful of flavor and energy! Something worth trying, isn’t it? It comes in a regular blend and a Bitter Blend packaged for the Ginseng machine (Available at Barzula) or in pouches to make an instant drink. 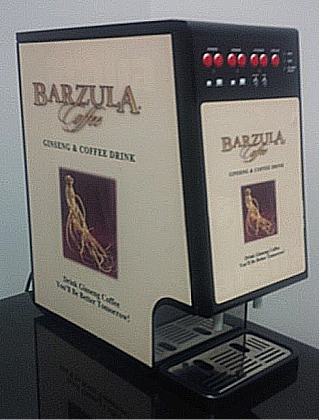 You can also find it in Capsules used with an Adaptor arm (Available at Barzula) for the traditional espresso machines.